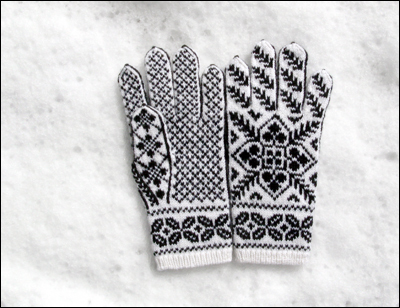 I finished these gloves a month ago and decided to take photos yesterday afternoon after a fresh snow fall. I might try for better photos later. I can't say enough good things about Dale Baby Ull, and Shepherd Baby Wool 4 Ply is a great match. 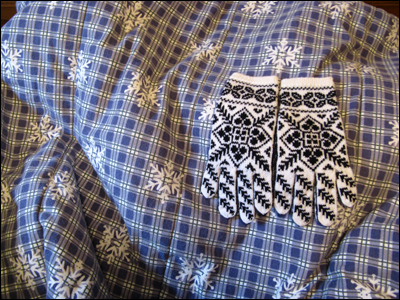 I have extremely sensitive hands/wrists and can't stand to wear a lot of wools on my hands, but this wool is so comfortable and soft. If I could afford it I would knit just about everything in Dale Baby Ull. It's perfect for small projects. These gloves require two 50g skeins, one of each color, so around $12 total. Not bad. Cheaper yarn can be found elsewhere, but if I can't actually wear it then cheaper is hardly a good deal. My older brother and his wife are expecting another daughter in July so I should knit something for my new niece. Right now I'm working on a mindless stockinette sock, which isn't my idea of fun. Time to drag out the books/magazines and look for cute baby sweaters. The patterns from that book look gorgeous in black + white. You're right - the price and quality of Baby Ull for these types of projects make it a great choice!